Prince Harry is finally settling down with his American fiance Meghan Markle and new Ladbrokes customers can get Meghan to wear white at 10/1 (Normal odds are 1/500) with Ladbrokes + £5 free bet if you lose your bet. Nothing has captured the imagination of the world, including punters, quite like this Saturday’s Royal Wedding of Prince Harry and actress Meghan Markle. Within hours of the official announcement of Prince Harry’s engagement to Meghan Markle, bookies started taking bets on a whole load of betting odds. And now it's time to profit and make some cash on the Royal Wedding 2018! 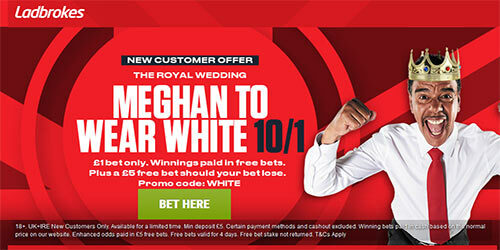 Ladbrokes offer 10/1 Meghan Markle to wear white at the Royal Wedding + £5 free bet! Register a new account with Ladbrokes before Saturday 19th May 12:00pm UK Time and claim 10/1 Meghan Markle to wear white at the Royal Wedding - instead of 1/500! 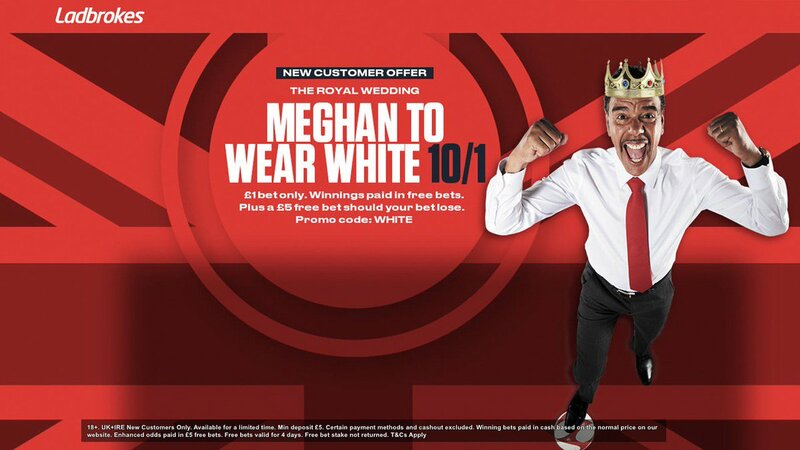 If Meghan wears white, Ladbrokes will settle your bet at the original price immediately. They will top up your additional winnings within 24 hours. Will Meghan Markle wear a white dress? There are plenty of reasons to believe she will! White wedding dresses have been a tradition in Britain for centuries, stretching back to the Victorian era, after Queen Victoria wore a white lace dress to her wedding. When Victoria got married, she was in pure white, which signalled to the world that she was this innocent girl and so different to the debauched monarchs who’d gone before. Traditionalists would suggest that, because the Suits actress has been married before, she will be unable to wear white. But the etiquette on white dresses for second marriages is now very fluid. A lot of divorced brides choose to wear white again. Actually, bookmakers are normally offering Meghan to wear white at 1/500! Ladbrokes are offering all BetAndSkill readers a special price of 10/1 Meghan Markle to wear a white dress at the 2018 Royal Wedding with Prince Harry, click here to get your massive enhancement in few simple steps! This promotion is open to UK and Republic of Ireland residents aged 18 years and is valid until 12:00 19/05/2018. If Meghan wears white you’ll become eligible to enhanced odds of 10/1. Alternatively, wears another color we will instantly credit your account with a £/€5 free bet. Free bets must be used withing 4 days and cannot be redeemed for cash at any time. Cash Out of qualifying bets voids the price boost promotion. "Royal Wedding: 10/1 Meghan To Wear White at Ladbrokes (HUGE boost!)"